Why Does Tapping on Glass Scare Fish? If you ever thought about tapping on the glass of your aquarium in order to encourage your fish to emerge from wherever it is he might be hiding, banish that idea from your brain permanently. Tapping on aquarium glass is a big no-no, as it scares poor fish unnecessarily. Tapping on fish tank glass scares fish simply because it bewilders and disorients them. They have no idea what's going on, and all of a sudden they hear an overwhelming tapping sound that's completely puzzling to them. When fish feel bothered in this manner, it often makes them feel compelled to swim away and hide even more. Not only does tapping on glass totally throw fish off, it also bothers their hearing, as they possess extremely strong hearing abilities. Fish are sensitive to noise in the first place, and if you combine that with the fact that sound moves extremely rapidly underwater, you have a recipe for a whole lot of unpleasant racket. Sound gets from one point to another five times more swiftly in the water than in the air. While fish for the most part lack external ears, their internal ears function highly proficiently. These ears are situated in their skulls. Remember that tapping isn't the only sound that can frighten fish. The sound of people yelling, for example, can be scary to them, too. The negative consequences in tapping on fish tank glass don't end with terrifying the fish. Note that when fish are alarmed by big sounds, they often react by immediately making attempts to flee, resulting in their running into things and ultimately experiencing wounds -- sometimes serious ones. 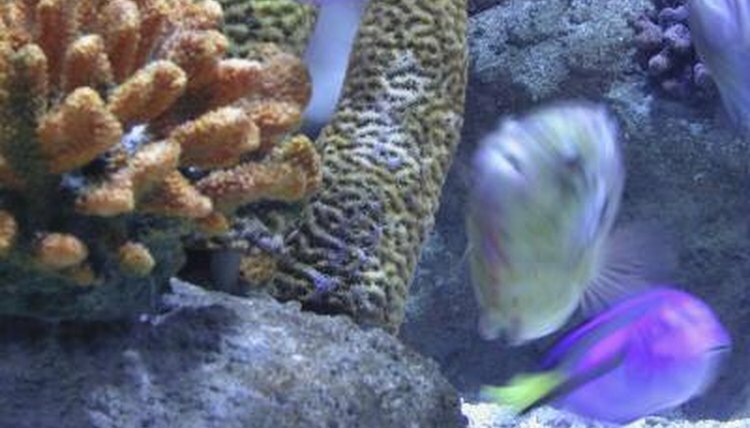 Apart from the possibility of injury, tapping on the glass also can bring upon vibrations, which in turn can trigger damage to a fish's internal organs. Bring the courtesy and respect you have for your pet fish to the aquarium fish you see in tanks at pet supplies stores, too. Don't try to "communicate" with them via tapping, and don't try to get them to come out from hiding that way, either. Be patient and wait for them to come out of their own volition. Not only is it important to never tap on aquarium glass, it's also important to never use your arms to pound the table or counter the tank is resting on. Home Economics and Livelihood Education 5; Dagoon, Napud, Celebrano et al.